How do you describe a heart-cracking-open experience? 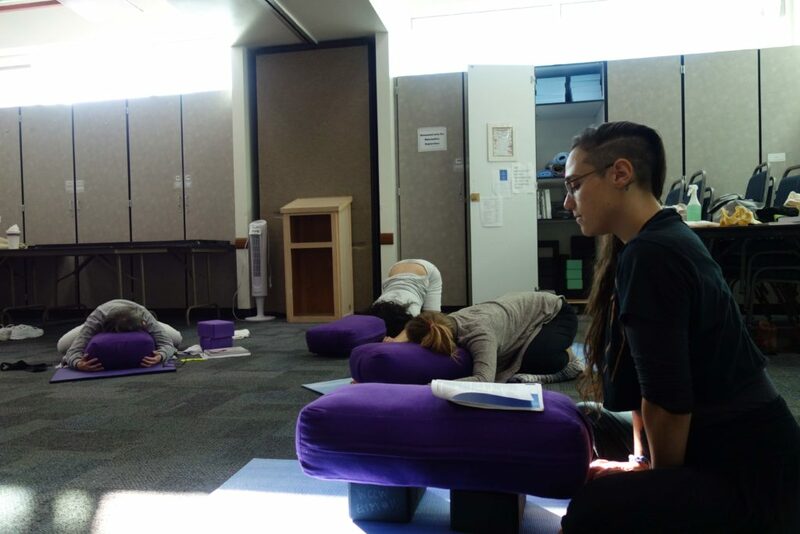 I have had the immense honor to be part of many transformative moments behind bars, but our recent Trauma-Informed Prenatal Yoga training at Washington Corrections Center for Women (WCCW) was something else. I struggle to find the words to describe it with the tenderness and precision it deserves. Three days of learning, sharing, grieving, and celebrating, with other “people with a uterus” (in the words of one of the facilitators, Patanjali). There were tears, lots of them, and also lots of laughter, camaraderie, and recognition. Within just a short time we became a small community, supporting and honoring each other. As far as I know, nothing like this prenatal yoga training has been offered in an American prison before. And to be honest, I am not sure much of this kind of work happens beyond bars either. Because it’s hard. Because it’s vulnerable. Because there is often so little community support for pregnancy, birth, and mothering. Imagine what it’s like in prison, where there are very few resources available. Many people are surprised to hear there are pregnant people behind bars at all. The truth is there are now more women behind bars than at any other point in U.S. history, including pregnant women. A largely invisible population, most women in prison and jail are moms. At WCCW there is a prison nursery program where new parents (if they qualify) can stay with their babies and young children. It is one of 11 prison nurseries in the country, most States do not have prison nursery programs. Although far less ideal than alternative sentencing*, the prison nursery program at WCCW offers a way to keep mothers and children together during a critical period of mother-child bonding and development. 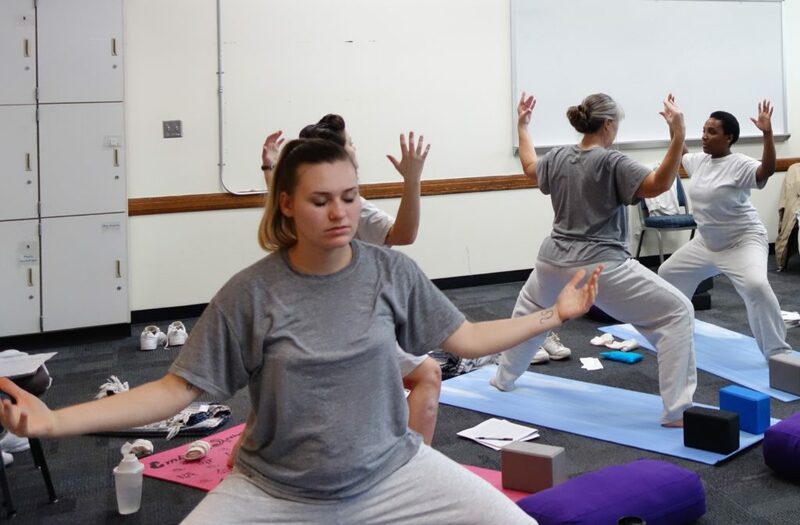 Our incarcerated teachers at WCCW had been wanting to offer prenatal yoga to pregnant and post-partum people ever since they graduated from their teacher training in 2017. After many months of preparation and partnership with our teachers, WCCW program staff, Patanjali de la Rocha of Birth Beyond Bars, and Kimberleigh Weiss-Lewit (who has worked with new moms behind bars for many years on the East Coast as a yoga instructor, doula, and lactation consultant), I walked into the prison on a foggy Thursday morning in November, not quite knowing what to expect. Patanjali, Kim, and I set up the room, clearing tables to create a circle of chairs, and waited… First, our teachers arrived, excited to be together again since the last time they trained as a group. Then several more women came, one of them close to her due date, the others recently post-partum. What unfolded over the course of the next three days is something I will hold close to my heart forever. Trust and vulnerability are rare in many places, but it is extremely rare behind bars because it’s often unsafe. Most women’s pathways to incarceration are complex and are usually connected to histories of sexual and physical violence. Vulnerability is a liability. But without opening up, people feel disconnected and isolated in their experience. Together we built a circle of caring that allowed, over time, for people to share their stories, fears, and hopes for the future. This included the facilitators and me. We wove a beautiful web of connection and mutual support. 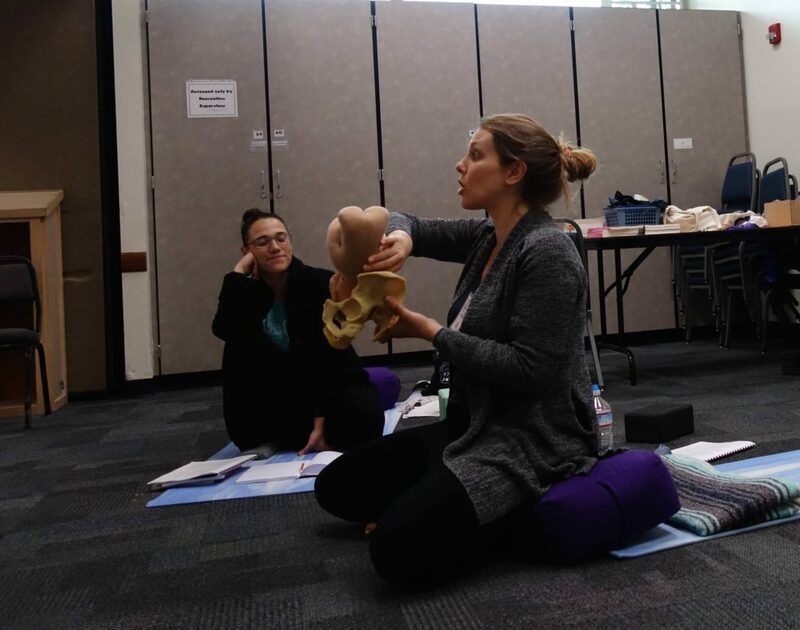 The vehicle for this incredible process was the prenatal yoga training, and we definitely spent a lot of time talking about how to offer a safe practice… But to me, the heart of the work went much deeper. Much (but not enough!) has been written about the shame and guilt society imposes on mothers. Now think about the messages we give mothers behind bars, it’s far far worse. Shame can keep us quiet and fearful of reaching out for help. At times the anxiety and heartache about “doing the best for my baby” were palpable. Women shared their feelings of isolation and their distress as they navigated the very common feelings of depression post-partum. Someone else would follow and say “I feel that too”. The facilitators would validate and honor people’s experiences with such love and kindness… it created an environment where everyone could hold space for each other. It was both heartbreaking and powerful to see the relief on someone’s face as they realized: “I am not alone. What I am experiencing is a normal part of being a new parent.” As we all trusted more, a community of caring naturally arose. What became clear was that there is a deep need for more information about pregnancy, birth, and post-partum. And everyone who was there wanted to share what they had learned with others. It was inspiring to see people realize that even behind bars they have choices, perhaps small ones, about their experience. I hope one day there will be no more pregnant and parenting people behind bars. I hope one day we have enough programs that meet the needs of vulnerable families and we end the cycle of trauma and incarceration. Until then, we need to support incarcerated women and their children in every possible way that we can. 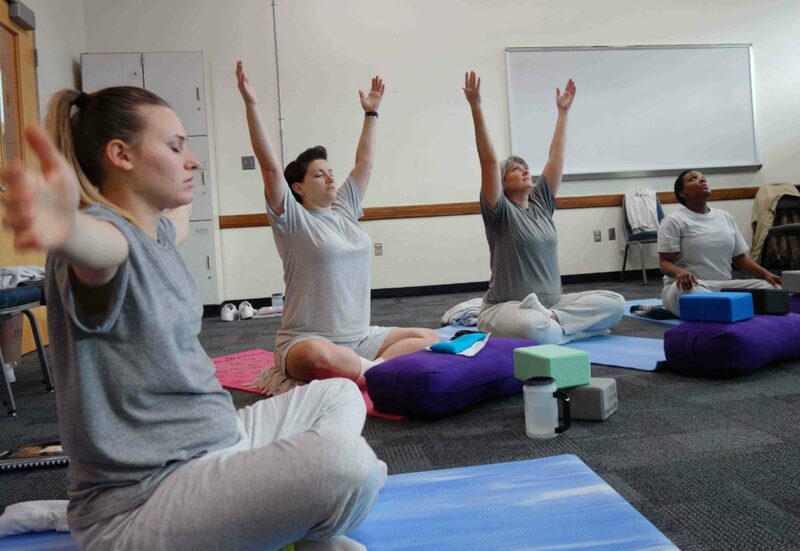 I am proud and grateful Yoga Behind Bars supports the leadership of incarcerated women in creating programs and support systems for themselves and each other. Because that is what we do when given the opportunity, we care for each other. *Washington State does not have family-based treatment programs where pregnant people or mothers can be sent as an alternative to prison time. ** All images used with consent of training participants. 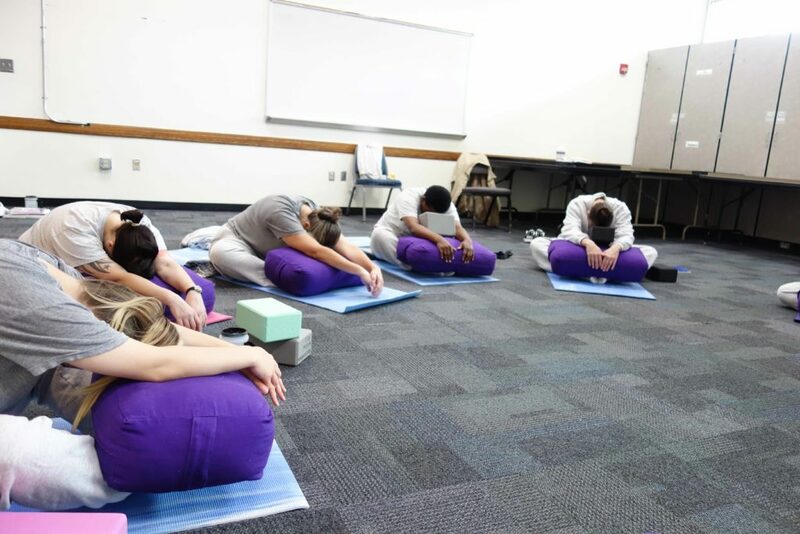 In partnership with Birth Beyond Bars, this Trauma-Informed Prenatal Yoga training was a first for Yoga Behind Bars, a first for the incredible facilitators Kimberleigh Weiss-Lewit and Patanjali de la Rocha, and a first for our remarkable incarcerated teachers who had requested this kind of training. We were joined by a few other women who currently live at WCCW, most of them brand-new parents. It was also a first for WCCW, and I am thankful for the support of the program staff at WCCW in making this program possible at all. Many other facilities would not have been willing to take a risk and try a new, groundbreaking program. If you feel moved to support this work, please consider making a gift. We receive no funding from the Department of Corrections or the State of Washington and are almost entirely supported by community members like you. This is powerful and important. As an early intervention provider, I sometimes have the opportunity to work with these mothers and babies. It is always an honor.